Many people are aware that it was Neil Armstrong who took that first “one small step” on the Moon in July 1969. The Commander of the Apollo 11 mission spent two and a half hours exploring the Sea of Tranquility with his lunar module pilot, Buzz Aldrin, in what would become the culmination of President John F. Kennedy’s pledge eight years before of “landing a man on the Moon and returning him safely to the Earth” before the end of the decade. Man’s first period of exploration of our celestial neighbour came to an end in December 1972. Twelve American men stepped on the lunar surface on six separate landings, eight of whom are still alive, and each of them have phenomenal stories to tell. When it comes to ranking them on how eloquently they describe the experience of walking on the Moon, it is easy to argue that Captain Eugene Cernan comes out on top. Cernan was born in a suburb of Chicago in 1934 and will enter his eighties next March, but one could be tricked into thinking his time as an astronaut was only last week after speaking to him. 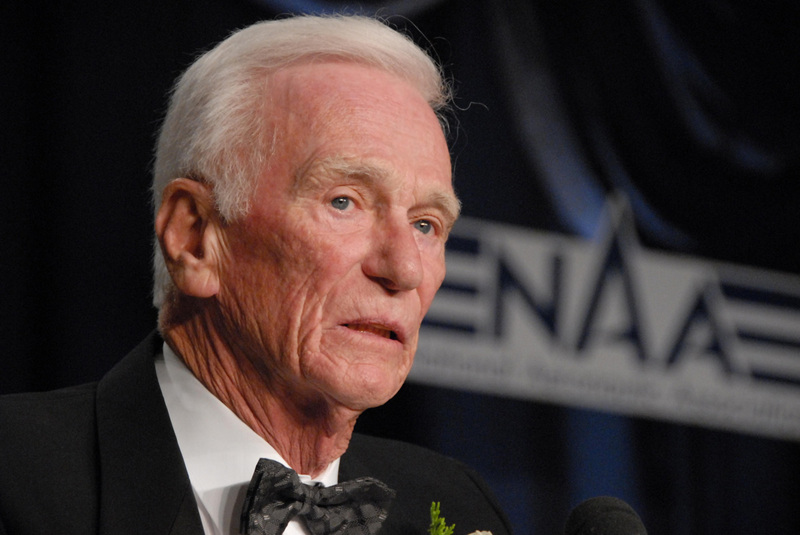 Prior to being selected by NASA, Cernan was commissioned as a United States Navy Officer through the Naval Reserve Officers Training Corps at Purdue University. Flying jet interceptors off aircraft carriers was what he had always longed to do, and so he became a naval aviator and did just that. NASA made a habit of choosing these early astronauts based on their ability to handle pressure situations, and flying jets in testing conditions certainly comes under that heading. It is clear from Cernan’s description of his early days in the Navy that his retiring rank of Captain was hard-earned. Selected as one of fourteen astronauts in NASA’s third group in October 1963, Cernan’s first assignments were related to Project Gemini. This follow-on program to Project Mercury achieved missions long enough to get to the Moon and back, perfected extra-vehicular activity, which involved spacewalks outside the spacecraft, and orbital manoeuvres necessary to achieve rendezvous and docking; all of which were essential if NASA were to be successful in their attempt to land men on the Moon. Originally assigned as back-up pilot on the Gemini 9 mission, he and Tom Stafford were promoted to fly the mission when the original prime crew were killed in a plane crash just four months before launch. The June 1966 mission is mostly remembered for Cernan’s ‘Spacewalk from Hell’, as he described it in his 1999 autobiography. During his two-hour excursion outside the spacecraft, he lost an incredible 10 and a half pounds in weight and suffered second-degree burns on his lower back after a suit malfunction. Only three men have flown to the Moon twice; the two of those that walked on the surface on one of those occasions are Cernan and John Young, who incidentally flew around the Moon together, along with Commander Tom Stafford, on Apollo 10. That mission was a dress-rehearsal for the Apollo 11 landing two months later and is known for attaining the universe record for the highest speed by any manned vehicle. The crew reached 24,791 miles per hour, the equivalent of 11.08 kilometres per second, in the command module on the journey home from lunar orbit on May 26, 1969. The final three Apollo missions are often termed the ‘J’ missions. They had a larger suite of experiments to conduct, and were longer-duration missions than the earlier flights. Armstrong and Aldrin spent only a matter of hours on the Moon on the first landing. In comparison, Cernan and his geologist-astronaut crewmate Jack Schmitt spent three days essentially living on the Moon in 1972. One major new feature of these ‘J’ missions was the addition of the lunar rover to take the astronauts further away from the sanctity of the lunar module than ever before. 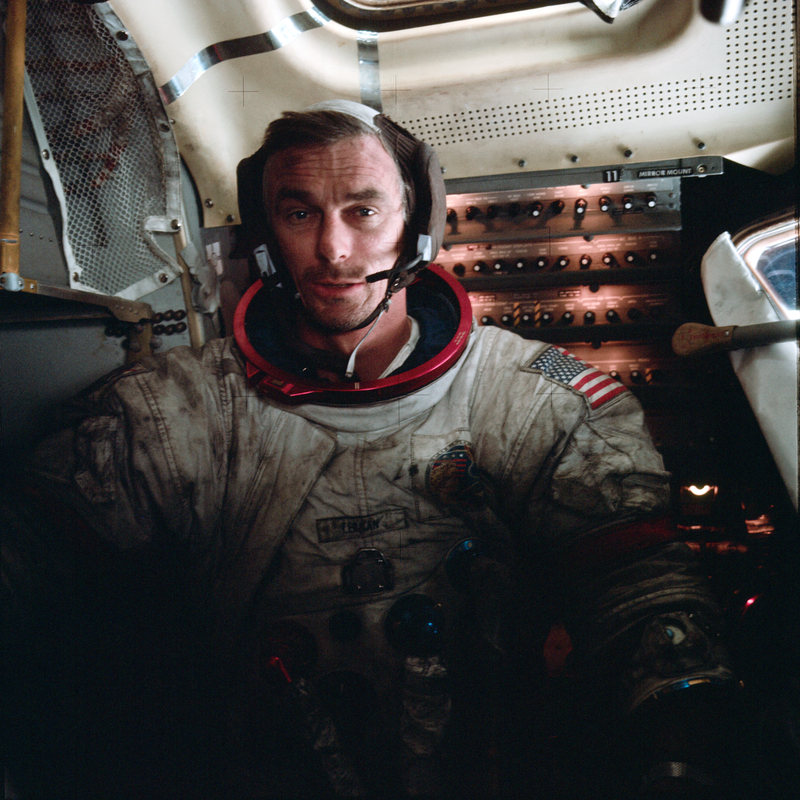 When asked what it was like to drive, Cernan describes it as, “Wonderful, you know, in one-sixth gravity you hit a bump, you hit a small crater and you’re on three wheels most of the time.” Cernan also has the distinction of holding the lunar land speed record in the Rover, 11.2 miles per hour. Many have said that the Apollo astronauts journeyed to the Moon only to discover the Earth in the process. The first ‘Earthrise’ picture taken from lunar orbit on Apollo 8 showed people just how fragile we are here on planet Earth. Landing on aircraft carriers and flying to the Moon are undoubtedly pressure-filled situations, but this was a different kind of pressure. “I’m in a cathedral, on a big pulpit like the Pope looking at all those people, and knew the world was listening.” He admits that he went through a dozen drafts in a week before settling on a final eulogy. 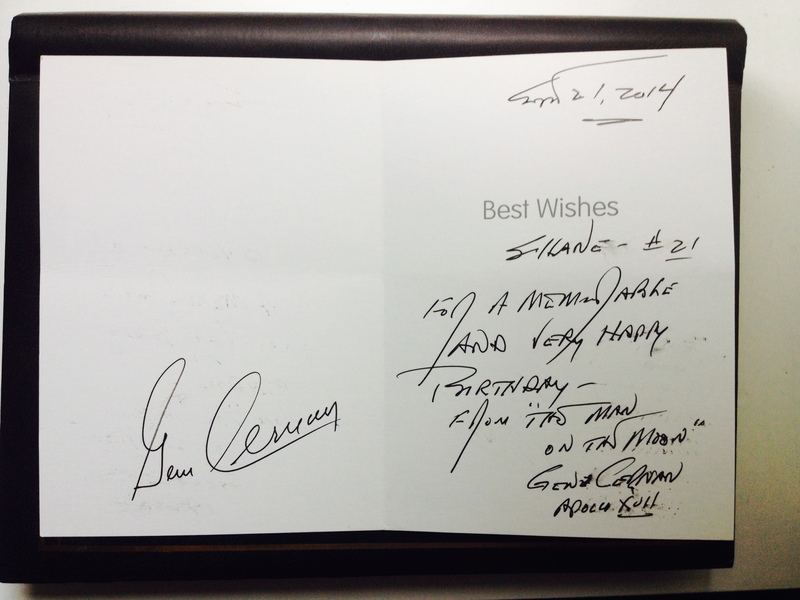 Approaching his eighties, Captain Cernan’s exploration days are behind him. Cernan is now an old man, but he still possesses that twinkle in his eye that symbolizes a life well-lived, so far. 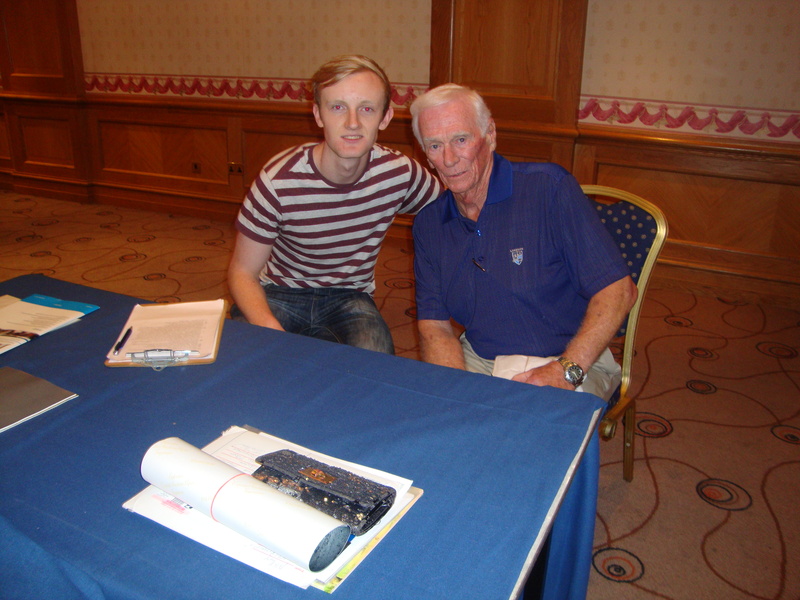 The above interview with Captain Eugene Cernan (Gemini 9A, Apollo 10, Apollo 17) was exclusively conducted during the ‘Autographica’ event at the Hilton Metropole Hotel in Birmingham, UK on Sunday September 22nd, 2013.